Install Sprinklers in Toronto, Hamilton, Niagara Falls with Raintree Irrigation! Do you want to install sprinklers in your lawn and garden? Are you looking for the best sprinkler installer in Toronto, Hamilton, Niagara Falls and GTA? Raintree Irrigation & Outdoor Systems is here to take care of your requirements in the most professional way. As one of the most experienced sprinkler installers across Toronto & the GTA, we deliver you excellent solutions for your garden. We install and service underground sprinklers systems for residential, commercial and municipal properties. Why should you choose Raintree Irrigation? Here are some compelling reasons why you should choose Raintree Irrigation & Outdoor Systems for your underground sprinkler Toronto project. We are one of the most experienced companies in the industry. You will certainly stand to gain from our expertise in professional sprinkler installations. Read below to know more about the great advantages that you will enjoy hiring our company. Get written estimation for your sprinkler installations In Hamilton, Niagara Falls, Toronto, GTA! When you contact Raintree Irrigation & Outdoor Systems for your sprinkler installation needs in Hamilton, Niagara Falls, Toronto and the rest of Golden Horse shoe, we will send you our expert who will make a complete review of your site and provide you with a customized quote based on your requirements. We will take into consideration all the factors that affect your sprinklers installation. Our experts will check the soil conditions, plant material, water sources, pressure and etc., before providing you with a complete written quote. We give all inclusive written quotes, you will know exactly how much it is going to cost you for your sprinklers installation. You will not be levied by any hidden fee at a later stage. You will find our estimates very competitive and transparent. Unlike most of the sprinklers Toronto companies, Raintree Irrigation & Outdoor Systems offers written warranty on all new sprinklers. The warranty will be provided to you along with the quote, so you can be sure of getting the best value for your money. Our company uses only top grade supplies in our landscaping and irrigation solutions. We have full-time sprinkler installation professionals with adequate training. Our experts are sent for regular in-house training and also attend training programs conducted by Landscape Ontario, Irrigation Association and Suppliers. We are a fully insured and certified company, when it comes to installing sprinklers in Hamilton, Niagara Falls, Toronto, the rest of Golden Horseshoe and carry $5,000,000 in liability insurance. Working with an uninsured contractor will leave you exposed to liability issues on worker injuries. 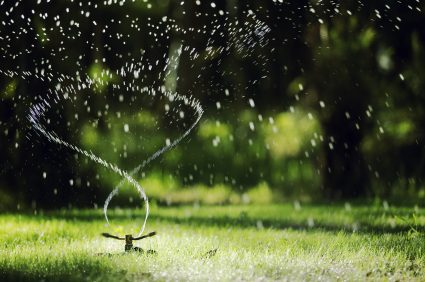 Raintree Irrigation & Outdoor Systems will provide you with a complete ‘as built’ drawings of your sprinkler installation system along with a detailed manual and customized watering schedules for your garden. We offer excellent customer service, whereby each time you call during business hours, you can talk to a person and not a machine. Contact us today to get your sprinklers in Hamilton, Niagara Falls, Toronto, GTA and you will receive detailed estimate of work involved and time needed for completion of the project.